The courage to believe in your ideas, to believe you have something to say, is very important. It is essential today to bring different ideas, to say things that are different, and to have faith in yourself. It is rare to find people who think like that, especially in this turbulent environment. And is much more strange to find those that have the courage to state this publicly. And Miro is right: the path of entrepreneurship in times of systemic crisis is led not only by having to model a different idea, but in a strong belief, in persevering to achieve the dream while managing the adversity and the ups and downs of the way. The key, really, is to have faith in you. 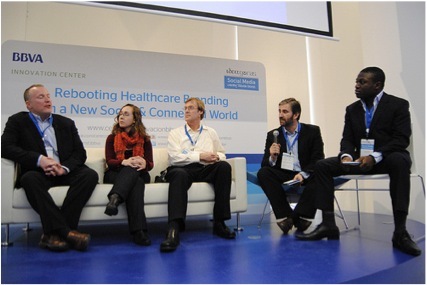 Back on 22nd November we celebrated our fourth annual conference on Innovation and Social Media in Health. The spirit of the community that day was not only created by the 150 attendees, but with the online participation of 450 people who made their voices heard through Twitter, sharing the experience and reaching 6.4 million impressions. Marc Vidal @marcvidal opened the event with an inspiring speech: the new economics of collaboration, transparency, entrepreneurship and horizontality in the new organizations will help us to overcome the systemic crisis in which we are still trapped. Antonio Ibarra @contraejemplo shared with us his first experiences as an early adopter of the Social Web within pharma. Ibarra is the best example of the new paradigm of marketing professionals who will radically transform the way we deal with branding. Francisco Lupiáñez @flupianez was an outstanding keynote: Social Media Based on Evidence. He skipped his daily university research environment to share with all us the outcomes of a European research study led by him, which end point was to gather avant-garde information on the real adoption of the Social Web in Healthcare. Great stuff as a tool for strategic planning activities of Social Media in Health! Michaela Endemann @wissit came from Austria to share with us the specifics of the adoption of the Social Web in Health in the area of Central Europe comprising Germany, Switzerland and Austria. Interesting to recognize that, despite being global, the new Social Web faces its particularities in each of the countries. Anabel Salazar @salazaranabel, gynaecologist specialized in assisted reproduction medicine. With a casual and very human speech, she shared her discovery of the Social Web and how – because of that – she has got more empowered as a professional and as a person. Her opening words, focused her speech: I am neither a co-founder nor a CEO, I am just a Social Media passionate lover! Veronica Botet @veronicabotet, Global Digital PR Manager at GE Healthcare presented a very recent case study that she has led in her company: the international campaign to prevent cancer and promote healthy habits #GetFit. An awesome and unique example of how Social Media can be the key to getting your message to your target audience. Elena Sainz @educadies, a digital opinion leader in the Spanish-speaking community of type 1 diabetic patients. From Mexico City, her excellent presentation was a real storytelling: a journey through her personal and professional life that has taken her to discover the power of the Social Web. It has not only helped to manage her everyday life as a person living with diabetes, but also helped to connect and educate people worldwide also living with diabetes. Christina Anthogalidis @binaryhealth stayed with us via video blogging. A Paediatrician born and educated at the USA, she currently works as a Senior Analyst in the New York office of Manhattan Research. In her presentation, she shared the main conclusions of a recent international study on the use of the Social Web in a group of doctors and the general population. Thomas Lee @tmlfox partner in Symplur, came from San Francisco to show his worldwide unique tool for tracking Twitter conversations related exclusively to the world of health. A great lesson: it is not just a question of posting tweets tagged with health hasthags, it is a step beyond to truly discover, understand and interpret. Paul Connolly @PGConnolly, C8Medisensors VP Marketing, a company based in Palo Alto. Connolly presented the first glucose meter for type 1 diabetic patients that is not invasive: a medical device that interacts with the user through the power of light, sending the measurements continuously to a smartphone app that will allow the patient to have rigorous, current and retrospective information.. The product has recently received marketing approval in the EU and will be available for purchase from the first months of 2013 in Germany, the UK and Spain. The speaker shared his promotion strategy, which is also nonintrusive: co-branding through the use of Social Media, mainly Twitter and Scoopit. I do wish to publicly send my sincere thanks to all those who made the experience of #Ideagoras 2012: the ten speakers, the entire audience that gave us their time on November 22, our main sponsor BBVA, the rest of the sponsors and my Ideagoras team. To progress you have to be a little daring, and believe in what you do and have intellectual ambition. We must be able to think with our own ideas … I invite you to surprise the world and propose innovative and different ideas. You can view a short video of interviews with the speakers here. Ángel González is the Founder and CEO of Ideagoras, a pharma advertising company based in Spain that is embracing the opportunities of social media. At its heart, Ideagoras is a business ecosystem that has as its core principle innovation in creating brand experiences and in bringing and managing change in organizations. For direct enquiries he can be emailed at angel.gonzalez@ideagoras.biz or visit www.ideagoras.biz/ for more information. Is it time to evolve our thinking and embrace social media marketing?